Our Luss Club campsite is located on the western shore of the beautiful Loch Lomond at the southern end of the Loch Lomond and Trossachs National Park. Its stunning views across the Loch and the park make it one of the Club’s most beautiful sites. Our Luss campsite is nestled in the conservation village of Luss which is a tourist attraction with a sandy beach, pier and regular boat tours. Picture perfect Luss was also the location of long running Scottish soap “Take the High Road” and has an excellent pubs, eateries and local shops. Base yourself here and you’ll be spoilt for choice when it comes to things to do. Walking and cycling are possible from the site and boat launching is possible for those with small non-motorised craft. For the more adventurous there are also hill walking and canyoning opportunities. While Loch Lomond itself is popular for canoeing, water skiing, bathing and picnicking, or simply sitting back and soaking up the atmosphere. 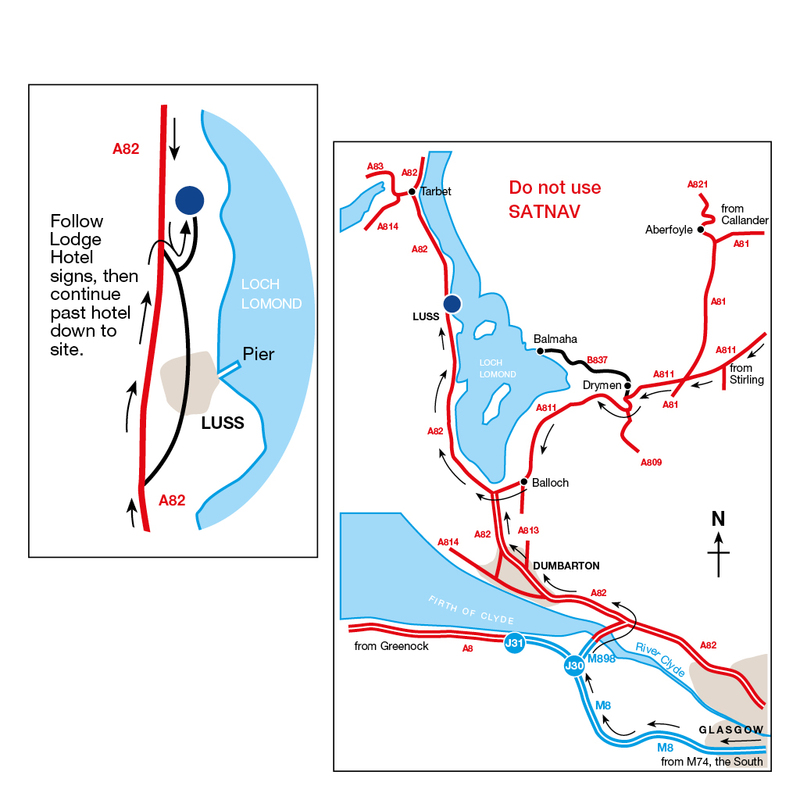 A bus stop just 500m from the site, and train station in nearby Balloch make a day trip to Glasgow possible from Luss. For family days out there is Balloch Castle Country Park and the Loch Lomond Sea Life Aquarium, Balloch or take a boat trip to Inchcailloch, one of the Loch’s islands with its own nature reserve. Due to licensing restrictions, all caravan and motorhome owners must be Club members 24 hours before arrival on site. Non-member tent campers are welcome. Please call to book 024 7647 5426 (M-F: 08:00-17:30 S: 09.00-13.00). If using Sat Nav please use postcode G83 8PA. The POI files located under the Travel Tab are recommended to be used by those following Sat Nav. Maximum of 45 caravans and motorhomes. A boat without an engine, that can be carried to the water, may be launched free of charge. Motor boats cannot be launched from or kept on site. Parking for motor boats can be found outside of the gate. TV and satellite reception on this campsite is very poor. 100% WiFi coverage cannot be guaranteed due to rural location, weather conditions and changing flora. These can cause variable signal strength. Hotspots are available. More information. Loch Lomond Shores in Balloch has a farmers’ market on the first and third Sunday of the month. Fresh seafood is available at Loch Fyne Oyster Bar, 30 minutes’ drive from site. One of the most popular Munros in the region, Ben Lomond offers breath-taking views over the Loch Lomond and the rolling hills below. With a peak of 3,196 feet and close proximity to Glasgow, Ben Lomond is a popular choice for seasoned hikers and amateur walkers. Located beside Loch Lomond, Balloch Country Park spans 200 acres and boasts panoramic views, walled gardens, guided walks and nature trails. Since 1990, the country park has hosted several major music events, including concerts for Oasis and R.E.M. Famous for its tranquil lochs and towering Munros, Loch Lomond and the Trossachs was Scotland’s first national park and is the fourth biggest in Britain. The national park is home to a diverse variety of wildlife, including red deer, wildcats, eagles and wallabies. Overlooking Loch Fyne, Inveraray Castle is an imposing fort built in the style of a French chateau with elements of Neo-Gothic and Scottish Baronial architecture. With spectacular views over Loch Lomond, this Club campsite is great for relaxing.